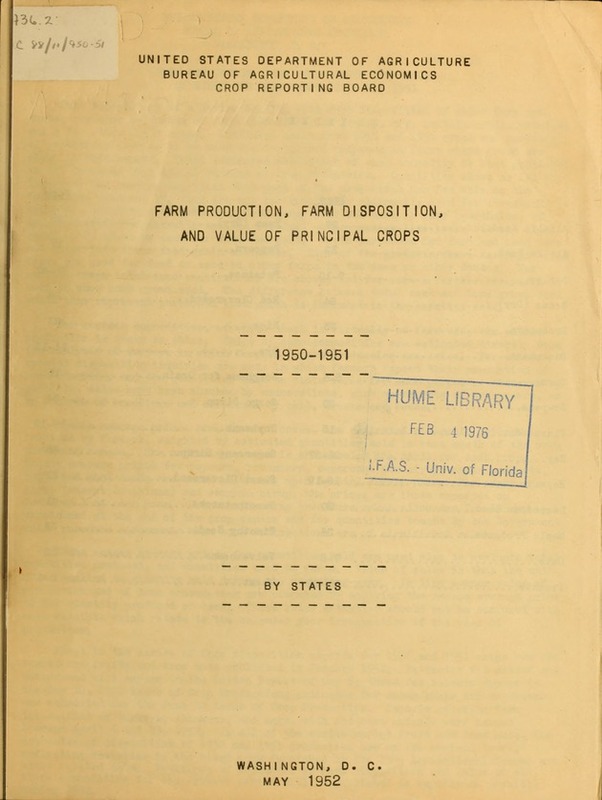 FARM PRODUCTION, FARM DISPOSITION AND VAILTZ. production is shown as sales. Sales of some commodities are estimated directly from. Texas, New Mexico, Arizona and California; July 1 to June 30 for all other States. Md. 1.95 2.06 10,066 11,064 h5 45 7,790 8,7?3"
valued at toe average rate per bushel, by States. should not be confused with calendar year income. .. use _farmers/_,tio- ohld use:_.
far Florida, Louisiana and Oklaihoma; October 1 -to Se-Ptember 30 for all other States. fused with calendar year income.
' : average : Value a Value I. The values shown are for tie marketing season or crone year and should not be cols. fused. with calendar year income. at'the average rate per bushel, by States. .
valued at the average rate per bushel, by States. Texan, New Uiexico, Arizona, and California; July 1 to June 30 for all other States. valued at the average rate ner bushel, by States. New Mexico, and California; July 1 to June 30 for all other Stn.tes. State Production : used for s Fed to Ground at mill for :! .- -- .- -, -- --. L fhne o liu -, . Ind. .625 164. 52 225 3. S.C. 75 34 7 21 ? Tenn. 150 98 20 50 80. June 30 for all other States. W.Va. 1.55 14.7 43 45 9.
deliveries valued at the average loan rate pur bushel, by States. :alued at the average rate per bushel, by States. The crop marketing season is Sentember 1 to August 31. Control Board regulations whether harvested or not. alied at the average rate per bushel, by States. e crop marketing season is September 1 to August 31. Wsason and should not be confused with calendar year income. manuts purchased for seed and is duplicated under "Sold." ptember 1 to august 31 for the S.E. krea, and August 1 to July 31 for the S.W. ised with calendar year income. Ala. 9.8 31,845 392 30,43.
peanuts purchased for seed and is duplicated under "Sold." to August 31 for the S. Z. Area. and August 1 to July 31 for the S. 'r. Area. / Practically none sold from farms,. .1,2G9 5S46 63,161 -- 61;52! valued at the average rate per 100 lbs., by States. 'California farms ia 78,000 begs in 1950 and 78,000 bags in 1951.
ed at the average rate per 100 pounds, Dy States. The crop marketing season is September 1 to August 31. SConverted to cleaned basis, not including culls. Me. 661 592 69 29,0.
the south:ern tart of th.e~United. tate Production pde per to Value of Value of. .
Maass. 540 483 57 35030 19,062 2,012..
1NeYo 5,678 5,167 511 20.40 115,831 10,424. N.Je .- 467 .413 54 33.50 15,644 1,809. .V 1,048 985 63 28.50 29,868 1,796..
Fla.. 60o 55 5 23.80 1,428. 119. T: renn,. 1,685 .. 1,575 110 32.00 53,920 ., 3,50. T|?e..crop marketing season is May 1 to ADril 30 in the southern part of the United. State Production; on farms : Sold' :100 lb.. req'd:. - L where grown Ihr .s.PDJ. fyarmerS L "
marketing season or crop year and should not be confused with calendar year income. The crop marketing season is October 1 to September 30.
fuscd with calendar year income. The crop marketing season is August 1 to July 31.
fused with calendar yenr income. The crop rnrketing season is kugust 1 to July 31.
arm DM-S3osit-o --: Sfson average: Value . : : :price per.gal. : : Value of. j/ December 1 price except for Louisiana. confused with calendar year income. State : tion farm : Sold per 1b. : tion : arm Sold : per gal. SDoe, not include uantitee poduced on ion-fo.Ipd. in Somwspt County, Maine. 2/ Beviied. season and should not be confused w-h calendar yea income. Y9"!2S-=l S M- .876 326,783 1,9-8 275,--83- --""
'E.,,Y T'' *^- ----^-------*--- ; --- -- --"
These quantities excluded in computing value of production. Virginia 6,8823,- 472 71 275. Kentucky 1,960 231 C9 147.
beginning April 1 of the year shown. : : harvest l use 3 'farmers: I use ! end August 1 to July 31 in all other States.